I first stumbled upon a recipe for this sauce, when I was scouring food blogs one lazy summer afternoon. 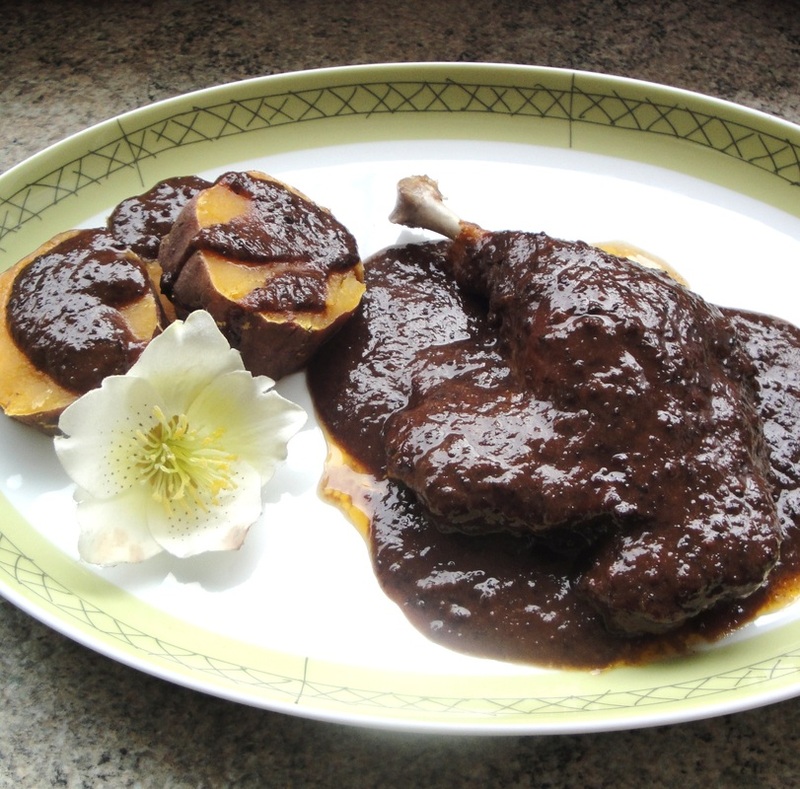 I saw a recipe for this sauce made with Duck on Zarela Martinez's website. Being a Duck obsessed Foodie, I knew that I had to try it. I admire Zarela for many reasons. But one of the things I admire the most, are her explorations on all cultural aspects of Mexican food, not just the Spanish and the Indigenous, but the African influences and regional differences. In America and other parts of the world, people tend to be unaware of the regional variations of Mexican food. What's eaten in the North may differ greatly from the foods that are eaten in much of the South. Outside of Mexico people tend to know about Salsa, Guacamole and of course Tacos. But they don't know so much about the Moles, the Birria Stews, or these dishes. I believe this Dish originates in Chiapas; Chiapas is considered one of the pillars of gastronomy in Mexico. The first time I attempted to make this sauce, I had a very specific idea of how it should taste. 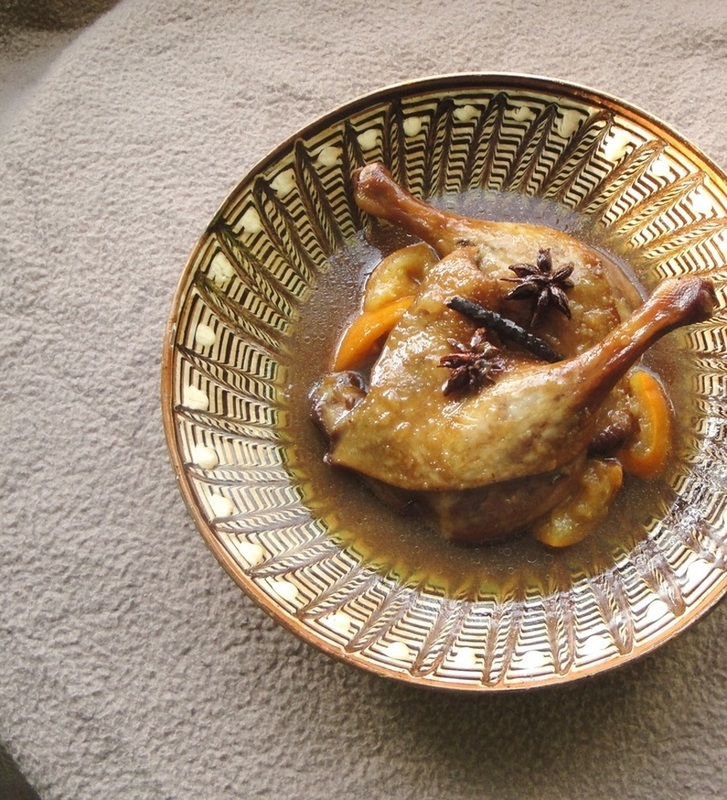 Zarela described it as her favourite dish, paired with Roasted Duck that she would serve at her New York restaurant. She described the taste as a combination of "rich, tart, sweet, spicy exploding like fireworks in her mouth." Although my first attempt was certainly not a failure, I didn't quite experience the explosive tastes that I was looking for. Of course, there are numerous different recipes for this sauce, and I've kept much of the main ingredients commonly used for this recipe. After my first hit and miss attempt, I was determined not to give up. I've come up with a tailored made recipe to suit me. What I devised is a simplified version of Zarela's recipe, and of course I put my own spin on this. I swear the sauce is so good that I could eat it on its own. I think it goes great with Duck and Pork. Feel free to tweak and measure to your taste, but I would not advise deviating from this recipe too much. Don't even bother trying to make it without dried fruits as it just doesn't work. I tried that the first time as I'm generally not a fan of raisins, but that has a lot more to do with eating them whole. The flavors from the dried raisins and currants really make this dish what it is. It has become one of my all time favorite dishes. 1 + 1/2 tsp Cinnamon, 5 plum tomatoes cut in half. After adding all the ingredients in this order. Let the sauce simmer on low for about 30 minutes. Add cornstarch if you want a thicker sauce. When finished remove from the stove top and let the ingredients cool. You can put the ingredients in a blender for a smoother sauce if you wish. This should store in the fridge for up to five days. 2 tbs of garlic paste or 1 garlic bulb peeled and chopped, 1 tsp of cumin, 1 tsp of oregano, and 1 tsp of chipotle paste and pour over the duck legs. Rub the ingredients in and marinate in the fridge overnight. The next day take them out, place then in a baking tray skin side up. Pour just over a quarter cup of water, mixed with red wine at the bottom of the baking tray. Then place the ducks in an oven, my current settings are 190c, but your oven may be very different, so this is a guideline only. Roast the duck legs for about 1 hour and 25-30 minutes, or until the duck legs are cooked, turning almost halfway, so both sides are done almost evenly, but finish skin side up to get a nice colour. 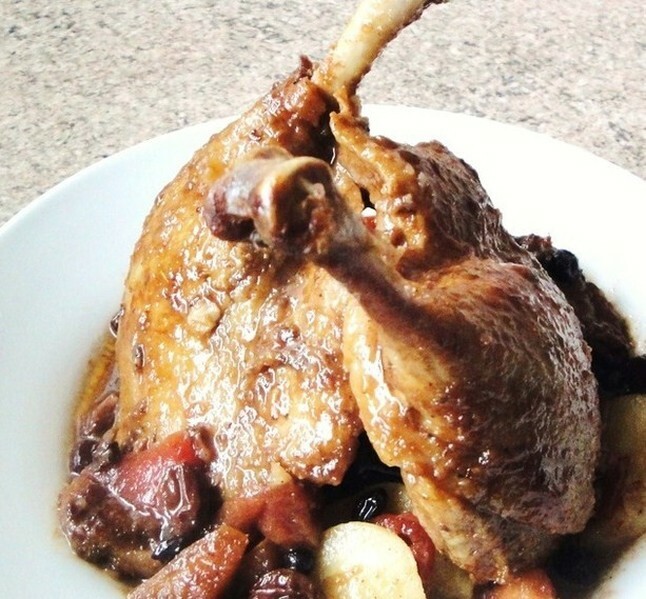 Pour the pan juices over the duck and let duck legs sit out for 30 minutes before serving with the Manchamanteles sauce. 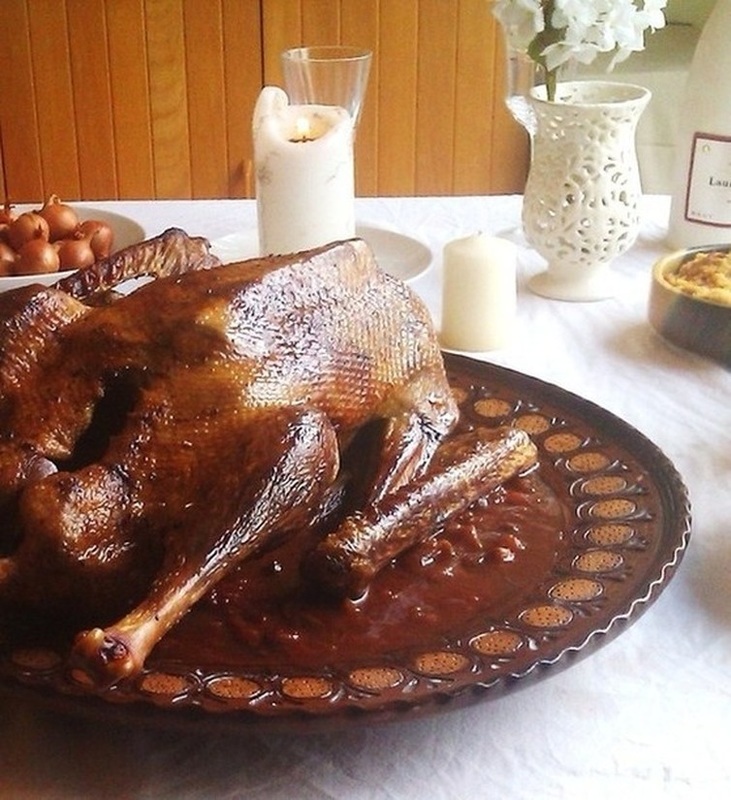 Store the duck in its pan juices and the manchamanteles sauce separately. The sauce will keep in a cold fridge for 6 days. Good side dishes are sweet potatoes-mashed or roasted, cornbread stuffing, plantains, a simple salad, or some corn on the cob. Lately I have been serving this with cous cous and it's a delicious combination because this sauce includes many ingredients used in tagines.